The CVPH FitzPatrick Cancer Center in Plattsburgh participates in several clinical trials conducted by the National Cancer Institute. Every day, there are more victories in the fight against cancer. These advances are often the result of years of clinical research and clinical trials. The FitzPatrick Cancer Center participates in several clinical trials conducted by the National Cancer Institute. They can offer promising new treatment options when other regimens are deemed less attractive or patients have difficult to treat or incurable cancers. Ask your Oncologist about the risks and benefits of participating in a clinical trial. 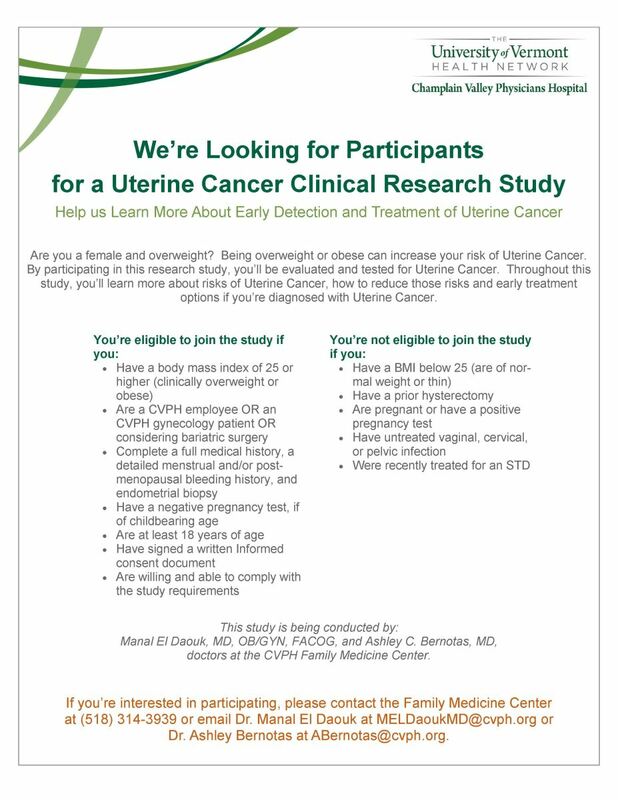 Are you interested in being part of a clinical research study? Dr. El Daouk and Dr. Ashley Bernotas are part of a nationwide clinical research effort to determine if uterine screenings should be an annual screening like mammograms or pap smears. Participants are seen on our Family Medicine Center in downtown Plattsburgh. You must meet certain requirements to be part of the study. Results are submitted to the American Institute for Cancer Research. Click here to see if you're eligible to participate or call Dr. El Daouk at (518) 314-3939.